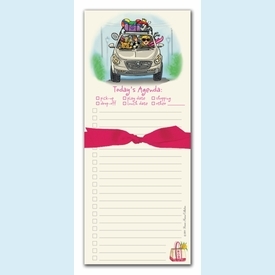 Perfect for every busy Mom, this fun note pad from the Bonnie Marcus Collection features a Mom on the go. "Today's Agenda" is printed below her with check boxes next to Pick-up, Play Date, Shopping, Drop-off, Lunch Date and Other. This 50 sheet magnetic note pad is printed on recycled, FSC certified paper and is wrapped with a pretty pink grosgrain ribbon. It makes a great gift! A portion of the proceeds from the sale of this product is donated to breast cancer research and education. NOTE: Only 1 left! SIZE DIMENSIONS: 3.75" x 9"